It is proven fact that marketing idea plays a vital role in the success of any business. The recent example of Reliance JIO is known to everyone, where freebies marketing strategy helped a lot to capture existing market from the competitor. However, if you are a small business owner or have started a business with a low investment you may not have big advertisement or marketing budget. No worries – Here are 20 Low cost marketing ideas for small business. All these marketing ideas are low cost and proven and will surely help you in getting business success. 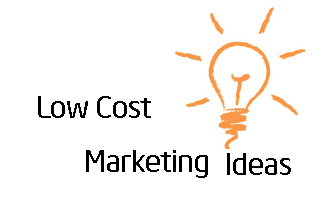 The first low cost marketing idea is to make your own customer referral program. This customer referral program can be used to attract new customer. You can give commission or discount for customer reference. You need to make a system in order to track customer reference. The second marketing idea is to host a free event. This event may be or may not be related to your business. Examples of such events are the conference, seminar, sports event, picnic etc. The next marketing idea is giving advertisement at a specific public place. The place should be at an open location where many people are visiting daily. An example could be cafeteria, cinema hall etc. Another marketing idea is to host a business award competition. In this idea, you need to host a competition related to your business. You need to invite subject matter experts, your competitors, and customers. The next is to start customer loyalty program. Customer loyalty program can help you to retain old customer. You can decide the time period for customer loyalty starting from one year to five years. You can give away freebies to loyal customers. In order to capture the local market, you can avail services for SMS-based marketing. These type of services are very effective. Another marketing idea is to send an e-mail to the customer. However, e-mail marketing is a cumbersome process and less effective. Whatsapp marketing is the latest concept in India. On WhatsApp, you can create a group of customers and share product photos and discount offers on WhatsApp. This marketing idea works for well for reaching a teenage customer. If you are good at using social networking sites, you can create your own facebook and twitter page. On this page, you can share your product detail, photos, videos and discount offers. This marketing idea works well in order to increase your reach globally. The next marketing idea is to offer freebies to the customer. You can offer free gift like printed t-shirt with a business logo, caps to the customer. In India, it is one of the most effective methods to increase your business. To increase brand awareness advertising on local radio is very good marketing idea. You need to make a good advertisement to attract the customer. The cost of local radio advertisement is low. To increase your business, you can plan to rent a booth at a trade show. The cost of renting a booth is high but it is very good marketing idea. You can surely increase your business as the majority of customer interested in products are likely to visit the trade show. Another unique marketing idea is to prepare sticker or magnet. This sticker can be pasted at a public place like shopping mall etc. The magnet can be pasted on your business vehicle and car as marketing material. You can also grow your business by giving advertisement about your product or business on local cable TV. This will help you to get popularity in the local area. The next marketing idea is to formulate frequent buyer reward program. Identify your frequent buyer customer and give him/her reward. This will surely help you to improve customer relations. You can also think of starting customer of the month program. In this program every month you can select one customer as a customer of the month and issue him/her certificate or gift as a customer of the month. Brand or business promotion can also be done by using a business mascot. You can deploy your business mascot at a public place. The business mascot can be a person, object or animal. The next marketing idea is to start your own website or blog. This idea needs technical expertise or investment of money for designing website or blog. However, it will take a lot of time to get popularity by using website or blog. If you are doing online business it is a good idea to buy advertisement space on the relevant website. This idea will surely help you in growing your website traffic and customer. The next marketing idea is to list your business in the local business directory. It is simple but sure shot way to increase your business. You can also think of supporting a cause or event, it could be educational event, seminar, conference, marathon or any other sports event. This is another popular way to gain publicity. Which marketing ideas you have tried for small business? If you have any great marketing idea for business, please share it in the comments below! « How to become rich while doing a job?